I am a defeated knight––noble in my essence (or so I feel), but waylaid and shrunken down while fighting a beast that no man could possibly face undaunted. The beast spits fire, inundates me with dust from its mighty, flapping wings, and seems to pull the very ground from underneath me. I cower behind my shield and do what I can to battle the beast back, but at best I can manage a draw in any of our fights. And day by day, the beast gains more ground. Or that's how I feel. The beast is debt. Random sums of money are my outmatched weapons. And despite my lobbing those missiles as hard and direct as I can, I feel like I'm never going to be rid of this scourge. As a (just barely) Millennial, debt is a part of our generational bargain. Unless you come from money or skipped higher education altogether, there is a good chance you hold some educational debt. If you are not independently wealthy, it is possible that you hold some retail debt (or have at some point in your life.) And increasingly it is likely that you have struggled with or currently are negotiating some kind of medical debt, especially as the most uninsured generation in American history begins to reach adulthood. In other words, even if everyone's dragons may be of different sizes and types, I'm not the only one fighting this fight. So, what does this mean for me? Am I just a horrible person for getting into this position in the first place? I know that's what some members of the generations that have gone before me would say. Is my lack of discipline, realism and pragmatic self-control the reason I'm here? Perhaps there are things I could be doing, but it doesn't feel like that's a fair take on the situation. Are there powerful institutional agents feeding my beast and ensuring that debt becomes a cycle of dependency rather than a source of opportunity? Almost certainly yes, but I am still culpable for where I'm at. Most of all, what am I supposed to do? Not "big picture," but day by day? How can I keep up the fight without making the fight the only dimension of my life? These questions stay with me, but answers are difficult to come by. This is not a part of life that we talk much about, and yet it defines every day for most of us. There are all kinds of venues for financial advice, life hacking, and calls for personal austerity. And there is all kinds of information out there to negotiate the numbers. But how about negotiating life? For a longtime––and sometimes still, to be honest––I told myself that budgeting just didn't work for me. I suggested to myself that what I needed to do was to cultivate good habits, and then the need for a budget would be irrelevant. And even as I write that, I can see the virtue in thinking that way, but also know that that just isn't how people work. And I have to admit to myself that it's not how I work. But that's the thing about a budget that is relevant to the experience of living a life in debt and isn't only about the numbers: a budget can foster those habits and bring a real sense of balance to your life. In other words, there is a real psychological impact to this practice, more than just whether or not it helps you save and manage your expenses (which it will also do!). 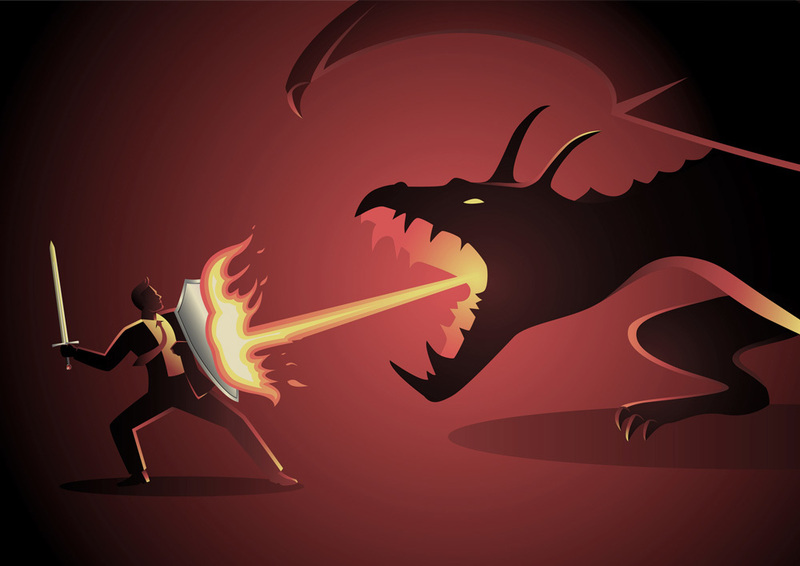 If debt really is a dragon, a budget is your shield. Sometimes, the burden of being in debt can make you think that the solution has to come immediately, because you just can't bare to be in this circumstance any longer. I can attest to being in situations where I have googled outlandish things to figure out a way to get out from underneath what feels, at times, like a suffocating weight. I think here there's something to learn from surfing. One of the most important skills for a surfer is learning how to fall into the waves. The disorienting power of the ocean can make even a seasoned swimmer or wave-rider panic. So, what you have to learn is how NOT to panic. A veteran surfer knows that she and her board will eventually float upward, even in the tumbling confusion of the waves. Living with debt is getting used to the tumble. But you have to have confidence that you are going to eventually float to the top. Because there are things you can control––a budget, being thoughtful about expenses and savings, etc.––but the sense of being overwhelmed only comes from focusing on things that are OUT of your control. Don't fall into the trap of trying to fix this in the short term. Take a deep breath and fall into the waves. You'll find your way to the service soon. Here's the other thing about debt. Once you face it and take some of the necessary steps to defeat it, time is absolutely on your side. Even as annoying as compounded interest can be, money gets cheaper over time, and most young people become greater earners as the years go on. Now, that doesn't mean there's no struggle or that the intervening years are going to be no big deal. But the odds are in your favor once you get into the fight for real. So, if you are fighting, keep fighting. If you haven't begun to fight, now's the time to get started. Because given some patience, some internal peace of mind, some self-care and some optimism, and you'll have that dragon licked. +1 for Ramsey and the TMM book, or better yet the FPU class. And no, you don't have to buy anything to get the information. You can learn all you need to know from his radio show or podcast. We've been handling our money this way for 11 years (debt free for about 4 of them) and it's caused our net worth to increase by something like 7x our gross household income. Debt is a thief. Get rid of it by any means necessary. I'm with Bruno, Thank-you Alan. If you are serious about getting rid of debt. Ready Total Money Makeover by Dave Ramsey. If you follow that, you will work your way out from under the debt. Self reflection is good, but that book gives you a plan that works. Worked for me. Great post, Allan. Thanks for sharing your perspective.